For some five years, from the 2004 presidential campaign through the end of his term, indignant media headlines excoriated Republican president George W. Bush for failing to stop Sudanese dictator Omar al-Bashir's genocidal war in Sudan's Darfur region. Hard-hitting media coverage echoed the imposing outrage expressed by Democratic politicians, leftist academic theorists and fashionable, liberal Hollywood celebrities. Innuendo-inferring racism often riddled their righteousness. Like, rich white guy blind to the plight of suffering Africans? Why, the moral midget doesn't recognize our responsibility to protect the helpless! Any of these paraphrased spiels stir strident -- and ironic -- memories? Here's truth that should truly appall everyone who gives a real damn about genocide. As 2015 begins and we enter the sixth year of Barack Obama's presidency, the Darfur War continues. If you weren't aware, aw, shucks. Today Darfur's tragedy receives sparse, once-over-lightly major media attention. Which leads immediately to a noteworthy irony. In 2007 then-Sen. Obama told Save Darfur "The U.S. has a moral obligation (to act) any time you see humanitarian catastrophes." Failing to curb genocide leaves "a stain on our souls." I agree with that. So what do you do, Mr. Obama? Campaigning in Iowa (November 2007), Obama said as president he would employ "strong diplomatic measures" to promote negotiation between Sudan's government and rebels and encourage China to pressure Bashir to "cease hostilities. " Obama's phrase "moral obligation" echoed an academic scheme propagated by his current U.N. Ambassador, Samantha Power. Once upon a time, Ms. Power declared that America has a "responsibility to protect" the vulnerable. The abbreviation is R2P. It fits on a bumper sticker. 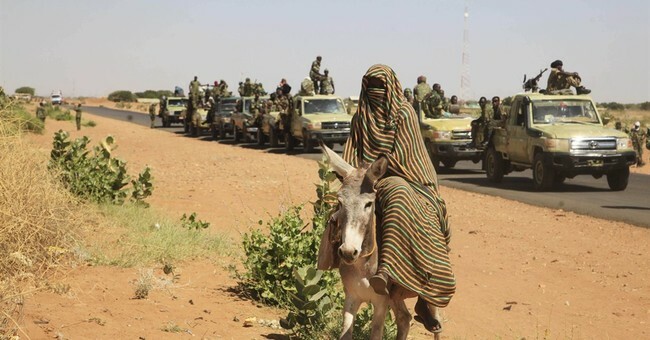 As for policy in 2015 Darfur? Crickets. Evidently, Bashir relishes irony. The International Criminal Court has indicted him for genocide. His security forces, however, continue to conduct genocidal operations. In response, Obama and his self-proclaimed smart diplomats wring their hands and issue press releases. In December Bashir sneered as he declared victory over the ICC. Liberal internationalists extol ICC warrants as instruments to secure justice for innocent victims. They could do that, but Bashir knows numerous countries are increasingly reluctant to enforce them. The U.N.'s Darfur record is simply tragic. U.N. personnel in Sudan had clues, but senior bureaucrats came late to the crisis. The Fur tribe (dar Fur, Land of the Fur) rebelled in 2002. In February 2003 Bashir escalated. Agence France Presse noticed Khartoum's Darfur offensive. I wrote a brief analysis Strategypage.com published Feb. 26, 2003. It's still on the web. The key info: Khartoum employed Arabized tribal militias. Native Zaghawa and Fur were fighting back. In the long North-South civil war, Khartoum had used militia raids to kill Black African South Sudanese civilians. The raids displaced population, which is genocidal by design. Expel people from their villages, burn their crops and starvation kills them. Back to Darfur: in February 2004 Bashir claimed Khartoum had crushed the Darfur insurgency. It hadn't. Under-Secretary-General for Humanitarian Affairs Jan Egeland began conducting regular complaint sessions, calling Darfur a neglected crisis. Well, it was. Egeland said Khartoum had committed ethnic cleansing (genocide). Yes, Khartoum had -- for about a year. The U.N. decided to augment the African Union's Darfur peacekeeping mission. In 2007 the U.N. and A.U. formed the "hybrid" UNAMID peacekeeping operation. In 2009, UNAMID's commander announced the Darfur war "has effectively ended." Unresolved "local issues" remained, but the big war in Darfur was over. Today the commander's assessment rates is insanity, not irony. This month, January 2015, the U.N. reported that in 2014 targeted attacks on Darfuri civilians destroyed 3,000 villages. As for Obama's promise to bring Chinese pressure on Bashir? China, a major buyer of Sudanese oil, usually behaves as a Bashir ally with a U.N. Security Council veto. Beijing just finished building a new, gaudy presidential palace for Bashir. The January U.N. report concluded Bashir's government routinely violates the U.N. arms embargo. Chinese weapons stock Khartoum's arsenals. Well, China needs oil; Bashir needs guns.